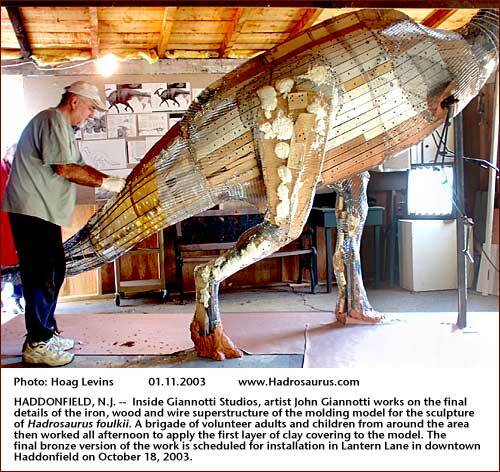 HADDONFIELD, N.J. (Jan. 11, 2003) On what might be called the "Clay Day" of the Haddonfield Hadrosaurus foulkii sculpture project, adult and child dinosaur enthusiasts gathered at Giannotti Studios on West End Avenue to apply the first layer of clay to the full-sized model. Above, left, artist John Giannotti makes ready before the first volunteers arrive (click for larger photo). A five-hundred-pound load of special sculpting clay (above, right) was on hand for the day's event, donated by Chavant, Inc., a modeling clay supply firm located in Red Bank, Monmouth County. Giannotti demonstrates how the clay must be worked in and around the wire-and-wood superstructure (above, left). Putting on one of the first patches was Sheila Goodman, Director of the Haddonfield Business and Professional Association (above, right). This first raw coat creates the initial overall base surface on which additional clay will be applied as the actual textural features of the dinosaur are sculpted into place. Throughout the afternoon, a steady stream of children and adults arrived to stare in awe at the towering figure and take up handfuls of clay that had to be worked like gobs of putty before being pressed onto the wire mesh. After several hours, the rudimentary surface contours of Hadrosaurus foulkii began to emerge, (above, left). Neal Rochford of Rochford Printers (in brown coat) works upward toward the beast's backbone. Meanwhile, laboring diligently on the underside of the massive dinosaur tail (above, right) is Jake Novak, a student at Elizabeth Haddon Elementary School.